Man, December has been a busy month for me…check out one of my latest projects. Oh! Before I get to the tutorial, check out this photo of all the wood I carted home. See that second cart with all that sheet wood? That is 3/4″ redoak plywood that normally sales for $47 each, but I picked up for $15 each! It’s 8 pieces that were put aside because of small chips in the veneer surface and being sold for 70% off. I didn’t need 8 pieces but I also couldn’t pass it up so I bought the whole thing. : D Lucky day or what? Alright alright, enough photos of my shopping escapades. Below are the step by step instructions so you can make your own. 1) I wanted my seat to be at 18″ and the arm rest to be 10″ above that, so I grabbed a 4×4 and cut two lengths of 28″. 2) To figure out about how high to make the back posts, I actually measured how high the back of my kitchen table chairs came up, which was 42″. So I grabbed my other 4×4 and cut two lengths of 42″. : ) It’s a start. Next step was to start making the seat. I decided to make it 41″ long and 18″ deep. I figured that would seat two comfortably. 3) I grabbed a 2×4 and cut two lengths of 41″, and three shorter lengths of 15″, then used my Kreg Pocket Jig to put them all together to create the frame of the first seat. 4) Now I cut a top piece out of 3/4 plywood and also used pocket holes to attach it to the frame. If you do not have the Kreg system, then go in from the top with screws. Just make sure to counter sink them so they are flush with the top (which will be the seat when it’s put together). Note: I don’t have the Kreg spacers, so I just used a scrap piece of 2×4 to create the 1 1/2″ space, then clamped it in place while I drilled my pockets. 5) Two benches are needed so I repeated steps 3 & 4 to create a second one. 6) To attach the bench that would become the seat, I laid out a line 18″ from the bottom on both posts then lined up my seat and used 3″ screws to attach it. Since I wanted the top of my seat to be 18″ high, I aligned the top of the bench to the line. Note: Before attaching them, make sure the posts are the same distance apart the entire length down. Do this by measuring the distance between the posts at several different points and make adjustments to their position when needed. So my posts are 10 3/4″ apart here…. 7) To attach the second bench, I repeated the same steps except this time I measured 1 1/2″ from the bottom of the posts. On the first bench I aligned the top with my mark, but on this bottom one I aligned the bottom to it. 8) Next I made the arms. I first tried to use one of the fence pickets but they are slightly smaller than 3 1/2″ which is the width of the corner post, so instead I grabbed a 1×4 and made my own dog ear pickets. To make the dog ear, just simply take a fence picket and use it as a template to trace then cut it out. Then I made two pocket holes on the bottom. 9) Then used Kreg screws to attach the back onto the post, then four 2″ brad nails to attach the front. I shot these nails in on the top then filled them in with wood filler. Looking at the original bench, the pickets are attached to a horizontal support that is placed on the inside of the posts, but I didn’t like that because it just takes up seating space. I also didn’t like the option of just screwing the supports on the back because it looked cheap….so I notched out the back to insert a 1/2″ x 3 1/2″ board and it would be flush with the post on the back and only take up 1″ of bench space. If I knew this was the route I was going to take, then I would have used my dadoe blades and table saw before assembling…but now that the posts were attached I had to figure out a different way to make those notches. 10) My husband taught me how to use a circular saw to do it. I set the depth of my blade to just slightly over 1/2″ then laid the bench on it’s side and made about 8 or 9 passes through my marked off area then came back through with a chisel and hammer to knock out the wood. I did this on all four areas coming down 2 1/2″ from the top, then 2″ off the seat. 11) Now I was able to cut a fence picket to length and fit it into place then used two 3″ screws in each posts to attach them. Oh look, there’s Cody. : ) Supervising my shenanigans with the saw….I rocked it though. 12) Since the pickets I bought were dog ear style but my friend wanted pointed, I held one up against a picket on the fence around my house and traced then used a jigsaw to cut. You only have to do this once, then you can use it as a template for the rest. 13) To put the pickets on I first found the center of my top support at 20 3/4″ then left a gap of 1 3/8″ between each picket and put four on each side of the center picket. 14) Wanting them to be on straight I would first put in a 1″ brad nail on the top then use a level to get it plum then put in another brad nail on the bottom. Now that it was tacked into place, I went back and put in another on the top and bottom. Note: Make sure the bottom of the picket is flush with the bottom of the horizontal support. Here is a photo with the lengths I used for the pickets. Awesome, this thing is really coming together, now it was birdhouse time. I wanted to use the fence scraps to make the houses, but couldn’t because they are just slightly shorter than 3 1/2″ and I wanted them to be flush with their posts. 15) So I grabbed some scrap 1/2″ plywood I had in my shop and cut a 3 1/2″ wide rectangle then measured 6″ on both sides then drew a horizontal line. Then I used my miter saw to cut two 45 degree angles to form the roof. Then I measured down 1″ and used a 1″ paddle bit in my drill press to make the hole. 16) Next I used a 3/8″ drill bit to make a hole for a 2 1/2″ piece of dowel rod that made a perch. 17) I made the sides 6″ tall and 2 3/8″ wide and the roof pieces 4 1/2″ and 5″ long, then put it all together using my nail gun. 18) In case these are ever used as real birdhouses, there needs to be someway of cleaning them out. So next I measured the inside and cut out a square bottom out of 1/2″ scrap. Then I used liquid nail to attach it to the post. Smear it around on the small square but be careful not to get it on the birdhouse side pieces. This way the house can be removed and cleaned out, but then put back in it’s position on the post. Ok so that’s all the building needed. Check it out…. 19) Next I primed and painted. I put on one coat of primer and two coats of paint. 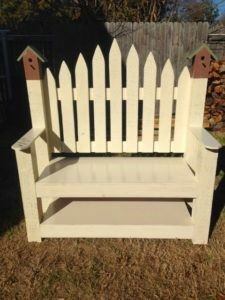 Note: Since this bench will be outside, I bought exterior paint. 20) Then to give it a distressed look, I took 150 grit sandpaper and just roughed it up some. It’s hard to tell in photos but in person you can see the distress-ness better. The original looks a lot more distressed than mine because I used brand new wood, so even when I distressed it in spots down to the bare wood, the wood is still a light color and doesn’t show up as well as weathered/aged wood. There are two options for getting the amount of distressing of the original: 1) you can use aged wood. 2) you can slap on a coat of stain to darken up the bare wood showing through. If you do this second option then just brush it on then quickly wipe it off. That writing you see on the armrest in the above photo is an inscription my friend asked me to put on. Painting the bench is considered ‘sealing’ it but since I distressed it in places and the bare wood is showing I wanted to put a clear coat seal on to protect it as well. 21) So I put on three coats of polycrylic, waiting at least two hours in between each coat. Done! What do you think? Hopefully my friend and her grandmother will love it. Since I used my Kreg pocket jig, all the screws are hidden and anytime I used my nail gun I filled in the holes with wood filler. I recommend doing this so the final product will come out looking very clean and sharp.